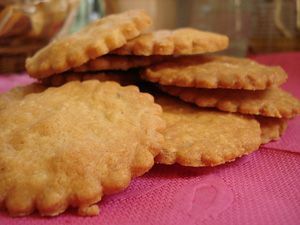 This is the basic, classic version of the sables cookie recipe. It can be varied in so many ways, from adding a flavored cream filling to spicing the batter. Make your own signature sable recipe or enjoy it the traditional way - as comforting vanilla sables. In a medium bowl mix the flour and baking powder and set aside. In large mixing bowl, cream the butter and sugar together until smooth. Add the egg and vanilla extract and mix in the dry ingredients until a smooth dough forms. Form the dough into a disk shape or 2-inch diameter log. Wrap the dough in plastic wrap and chill for 1 hour. Prepare the egg wash by beating together the egg white and 2 teaspoons of water. Roll out the disk of dough to ¼-inch thickness, and cut out the ​sables using a 2-inch fluted cookie cutter. If using a log of cookie dough, slice it crosswise into ¼-inch thick coins. Brush the sables with the egg wash, and bake on a parchment lined baking sheet for 15 minutes, or until they are lightly browned around the edges. Cool the sables for 2 minutes on the cookie sheet and then transfer to a wire rack to cool completely.